1400 B.C. : Ten Commandment tablets given to Moses by God. 500 B.C. 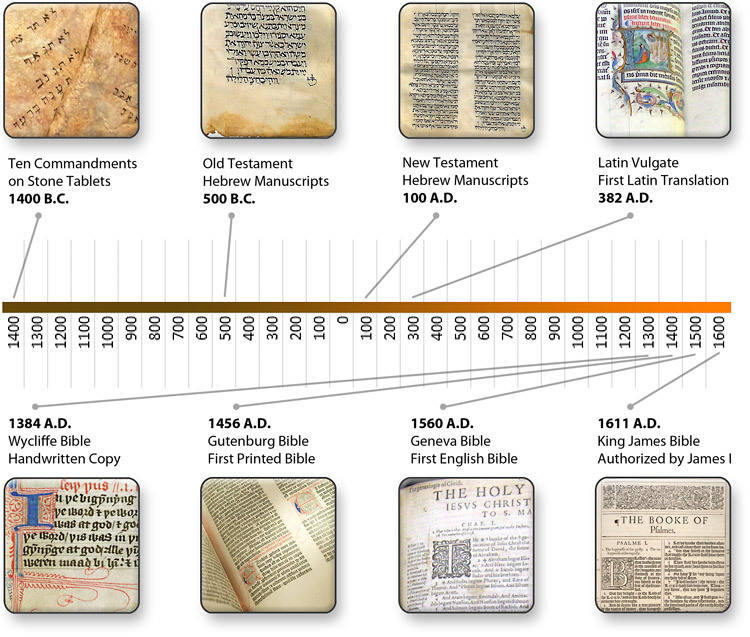 : Old Testament Hebrew manuscripts completed. 200 B.C. : Old Testament and Apocrypha Greek manuscripts completed. 100 A.D.: New Testament completed. 382 A.D.: Latin Vulgate manuscripts produced. 1384 A.D.: First complete Bible ever reproduced. By John Wycliffe. A handwritten copy of all 80 books: the 66 old and new testaments, plus apocrypha. 1456 A.D.: First printed Bible, the Gutenberg Bible. It used independently placed characters called movable type, which revolutionized book publishing. 1560 A.D.: The first Bible in English, the Geneva Bible. 1611 A.D.: The first King James Bible, commissioned by King James I of England. 1769 A.D.: The English is edited and updated to reflect the evolving language. 1885 A.D.: Apocrypha was removed, leaving 66 books. 1947 A.D.: Dead Sea Scrolls were discovered which helped validate the accuracy of the Bible. 1982 A.D.: New King James Version published to modernize the English.